Once slightly exotic to many Americans, the kiwi has gained in popularity. The egg-sized, fuzzy-skinned fruit with the startlingly green flesh that we buy at the grocers is much too tender to be grown in most of the United States. Fear not, the hardy kiwi (Actinidia arguta and Actinidia kolomikta) is much more resilient in cold temps but, even so, may need special kiwi winter care. 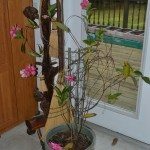 How do you go about winterizing hardy kiwi and does hardy kiwi require overwintering? Before we discuss winter care of hardy kiwi, a little information on the fruit is in order. Although related to the kiwis we purchase at the supermarket, the fruit of A. arguta and A. kolomikta are much smaller with smooth skin. Most varietals have male and female flowers born on different plants, thus you will need both a male and female, in a 1:6 ratio of males to females. Don’t expect to be munching on the fruit immediately; these plants take several years to mature. The hardy vines also need a substantial trellis for support. The most popular variety of A. arguta is called ‘Ananasnaya’ (also known as ‘Anna’) and that of A. kolomikta, called ‘Arctic Beauty’, both of which need a male and female to set fruit. A self-fertile variety called ‘Issai,’is also available, although this cultivar has low vine vigor and very small fruit. 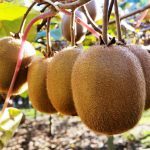 Does Hardy Kiwi Require Overwintering? The answer really depends on your region and how low temperatures get in your climate. A. arguta will survive at -25 degrees F. (-30 C.) but A. kolomikta will withstand temps down to -40 degrees F. (-40 C.). Both types develop shoots early and may be sensitive to frost, which does not usually kill the plants, but some tip burning will be evident. Spring frosts are of special concern, as the plant may have begun developing buds and young shoots. A subsequent frost will usually render a plant that does not produce fruit. The trunks of young plants are also more susceptible to injury during these spring frosts. Specific winter care of hardy kiwi is less likely for plants that are set in the ground. Those that are in containers are more susceptible and require care of hardy kiwi over winter. Either move the plant to over winter indoors or, if an unusual, short cold snap is expected, move the plant into a sheltered area, mulch around it and add cover to protect it. For young trees, be sure to wrap the trunk or cover with leaves. Using sprinklers and heaters in the garden proper will, of course, also aid in preventing cold injury to the kiwi. Start out by planting the kiwi in an area of well-draining loam with a pH of around 6.5 in rows 15-18 inches apart. Areas protected from high winds will also ensure a healthy plant that is more cold hardy.